My cool downstairs neighbor Elizabeth suggested we embark on a project she saw on TV: embroidered napkins. So we gathered our supplies and set to work, only to discover that neither of us knows how to embroider. After great confusion, here's my first attempt. Which only took... 2 hours? Don't laugh. I followed stitch directions I found online here, but decided I liked the stitching on the underside of my fabric more than I liked the stitching on top. So I ripped it out and figured out how to do the stitch "upside down." 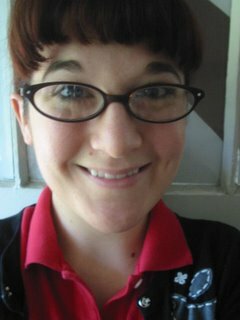 All you embroiderers out there will probably scoff, but I don't care. I'm happy with it. Now I only have 3 more napkins to go. Sigh. We hope to be done by Christmas. Your first try! That looks great! I started a project today--to embroider a picture my daughter drew...but I don't know what I was thinking since I got cross stitch fabric for it. It's all grid-like. Live and learn. super cute. i'm going to have to do some of these. I MUST try that, though I have no idea how to embroider. Are there any good tutorials online? 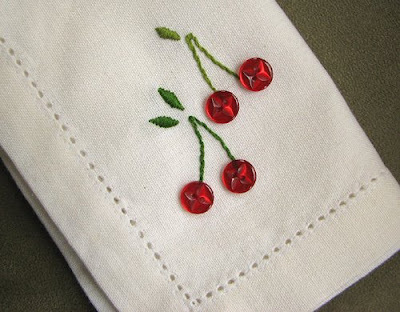 My kitchen is subtly themed with cherries, and I want those napkins. I love the use of the red buttons. Super cute! Hey, the embroidery looks terrific! I love the buttons idea! Great job! okay just found and absolutely love your blog. I could so see this on a cardigan. Oh wow, these are just so cute! Hi, Can I link to this post on my blog, using the photo? 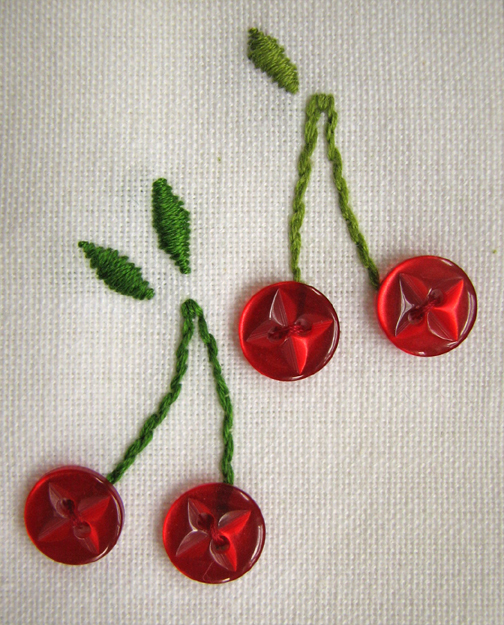 I think it a great button craft idea! You're welcome to link to How About Orange or use a single image with a brief description to link back to any post. Thanks, Jessica, I will be posting today!